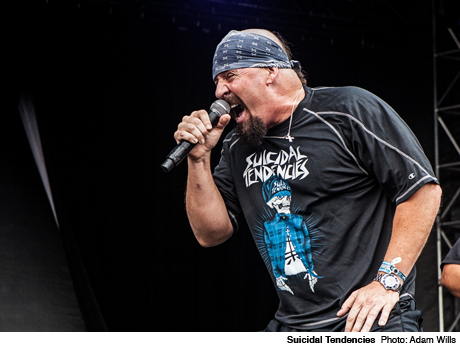 More than 25 years after the slow, haunting guitar opening of "You Can't Bring Me Down" first introduced Suicidal Tendencies' Lights… Camera… Revolution!, those notes still announce, with heightened drama, the band's arrival in front of a crowd. Cyco Miko Muir is the only original member left, and it's a little odd now to hear him indicting parents and calling for a Pepsi, but his attitude and vitality have hardly waned. ST's set was largely nostalgic, with other oldies like "Subliminal," "War Inside My Head" and "How Will I Laugh Tomorrow" taking centre stage. Even Muir's free-thinking anti-authoritarian rants sounded almost retro, but the Venice Beach five-piece were buzzing with electric energy (and the bassist's glowing green and yellow strings were a particularly nice touch).